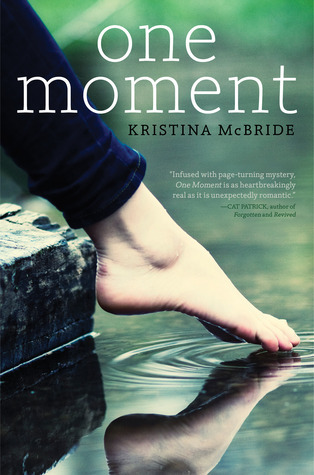 One Moment by Kristina McBride – It's Time to Read! I received this as an e-book from Netgalley. I haven’t read any other novels from Kristina McBride, however I read the synopsis and though it sounded liked a good book – and I was right! The story is about one moment in time that changed everything. A group of six friends, who have been best friends since they were small, are hanging out at the creek by where they live at the beginning of the summer holidays before senior year. Maggie, Joey, Tanna, Pete, Shannon and Adam are drinking, messing around and just hanging out. Maggie is dared to jump from the the top of the creek into the water below with her boyfriend Joey. She is scared of heights and never done the jump before. Shannon is pushing her to do it – there is almost malice in her tone as she thinks Maggie won’t do it. Maggie does up to the top with Joey, but something isn’t right. She notices Joey is wearing a bracelet, something he has never done before. All of sudden, she is hiding and crying under a tree, Adam is looking for her and there is screaming all around. She didn’t make the jump – but it seems Joey did, and he is dead. What happened? This is a well written, enjoyable book. I read it in the space of about 3 hours. I was hooked; the way McBride wrote the book made me want to know what happened. She jumps between past and present, telling the story about Maggie and Joey, and their group of friends, as Maggie desperately tries to get over Joey’s death, and remember what happened. The memories come back in flashes as we watch the group fall out, grieve and discover all of Joey’s secrets. It seems Joey was hiding a lot. I quickly worked out what his secret was – that he was dating Shannon as well as Maggie – and then realised that Maggie worked that out when they were about to jump. However, I liked reading about the friendships they had, how the story fitted together and how Maggie worked through her pain. Working out the twist didn’t ruin the story at all. I liked Maggie. I felt for her – her whole world was Joey, and losing him was awful. What made it worse was that she didn’t know what happened – did she kill him? I felt for her as she struggled through the grief, realised Joey wasn’t the person she thought he was and getting over the heartbreak her friends caused her. I liked Adam, Pete and Tanna too – Adam especially as Maggie was so important to her. Again, I wasn’t surprised when he revealed how he felt for her. The more the story went on, the angrier I got at Joey – he had seemed like a great guy to know, a great guy to date, but in fact he wasn’t at all, and right from the beginning Shannon seemed horrible. I like a book that makes me react to the characters and I wanted the best for Maggie and just felt anger towards Joey. This was a really enjoyable book. The story had me hooked. The answers weren’t a surprise but this was written in a way that kept my interest. McBride writes great characters that I could dislike, cheer on and empathise with. This is a young adult book, but that didn’t stop the enjoyment. It wasn’t a tough book to read and I flew through the story – wanting to know every last detail. McBride portrays teenagers in an accurate way – hormonal, reckless and often doing what they shouldn’t – like getting drunk and throwing parties. She writes the parents well – protective, scared for their children and loving. The story was interesting and although the language and writing style didn’t test me, I was gripped from the beginning and read this very quickly. This is a great read. I haven’t read this eBook but after reading your review, I think that the eBook is worth reading. I like reading an eBook that shows the development of each character throughout the rest of the story.